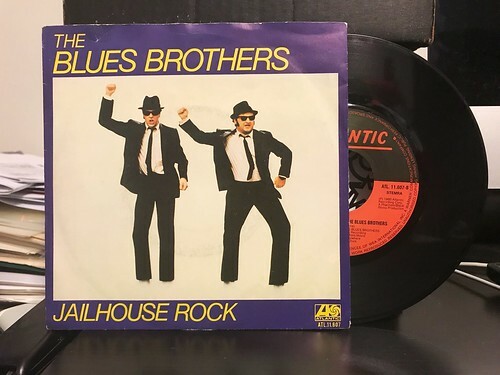 This is one of my favorite Blues Brothers 7"s. This version of the "Jailhouse Rock" single comes from the Netherlands and has "Sweet Home Chicago" as the B side. It has completely unique artwork and doesn't look anything like any of the other Blues Brothers singles I have. Even though it's a little weird that the image is chopped off at the ankles, that oddness only makes me love it more. Even the way I obtained it was somewhat strange. A seller on Discogs in The Netherlands had it listed. I tried to buy it from them directly and they wanted to charge an astronomical shipping fee. I think it was close to $60. For one 7". Crazy. Anyway I came up with a plan and with the help of the wonderful Scott from Brassneck, we had the 7" shipped to the UK and then it was sent over with some stuff from Brassneck (I buy records there, so should you*). Scott told me the seller shipped this in a gigantic box, so oversized for one 7" that it was ridiculous. Anyway, it's really cool addition to the Blues Brothers collection and I thank Scott for helping me obtain it.